Truly beautiful or as the French would say “Vraiment belle!”. Beautiful by name, beautiful by nature my sweet Jersey Cow, Belle, has the eyelashes to rival Audrey Hepburn! 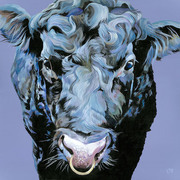 With hidden purples and blues in her coat this is a very fresh painting to brighten any space.